I'm not impressed with the so called 6sigma jet kit. It was basically just a bunch of jets and washers. On the dyno it made very health torque at 86ftlbs, but it was running so rich up top we stopped going for a bhp pull at 99.2bhp. I don't go above 6krpm that often so this doesn't bother me one bit, more than happy with 86ftlb! But now I know it's running so bad it's time to fix it, so just bought a dyno jet kit for it. Has anyone had any experiance of the stage1 kit on the XJR? Fitted the kit, DJ100 jets as I've got the full acro with pipercross and airbox mod. What a difference it's made. Lovely from the off and revs nice and clean all the way to the limiter. Hi Betty, have you had a re-run on the dyno yet to see what the power and torque figures are now? I'm interested in doing some simple tuning mods myself, but I'm unsure as to what actually 'works'. It's nice to see some 'sensible' figures for a change (impressive torque btw). I've scoured the net and other forums for before/after dyno readings and found fantasy figures of around the 130BHP mark. I think we all know that a 45BHP+ increase over stock (assuming 85BHP max at the back wheel) would take a bit more than a pipe, airbox mod, K&N air filter and a stage 1 kit. At the moment my old girl only has a Remus Revolution and K&N air filter (in the stock air box). I had tried the 4 degree ignition advancer, but only experienced very poor results - so I binned it. 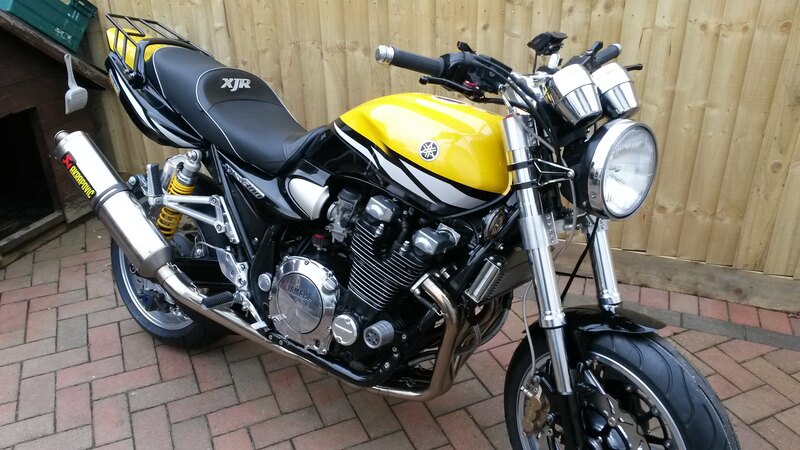 The fact that you've got your XJR running cleanly through all the rev range is very encouraging - and impressive. Hiya Pal, no not had it back on the dyno, I'm waiting till I need a new rear tyre as it takes a few miles off a tyre on the dyno. I've seen 130 mentioned, but I don't think it's possible without bigger carbs, cams or pistons. I'll be happy with anything over 120 as long as I don't lose the torque. The dynojet kit is worth the time and effort, the airbox mod makes sense when you look at it. Surprised to hear you say that about the advanced, I've had nothing but positive feedback, and I've fitted a couple to mates bikes. The single biggest boost to the grunt of the thing was a gearing change, I'm running 17/41 at the moment, thinking about going to 43 this summer just to see! What year is yours Mate? Hi Betty, mine's a 2000 SP running cheapo (?) 95 octane fuel, standard jetting and airbox (although the filter looks suspiciously like a K&N). The exhaust is a Remus Revolution with the baffle removed. The sparkplugs are nothing fancy. When I fitted the advancer, the performance was dire - there was an impression of more top-end, but that was only because there was a loss of mid-range. The motor had the typical tinny mechanical sound and muted exhaust note associated with over-advanced ignition timing and the bike struggled to hit 90-100mph. Perhaps the advancer will work with a higher octane fuel, but at around £1.40 a litre and a consumption of around 15-20mpg around town (just riding back/to work at the moment), it seems a lot of additional cost for little return. I've read something about changing the carb inlet rubbers for a later model - what's the purpose of this? Have they got a wider aperture and/or are they a different length? Hi Jooles, thanks for the info. So yours is pumping out 130+. That's a serious increase - did you do the work yourself and let PDQ do the tweaks - or did PDQ do everything? Did you have your bike dynoed before the work was done too? I'm estimating you've got an extra 40BHP at the back wheel over standard - how does that translate in real-world performance; acceleration, top speed, flexibility, fuel consumption etcetera? Apologies for all the questions - I simply have to know! 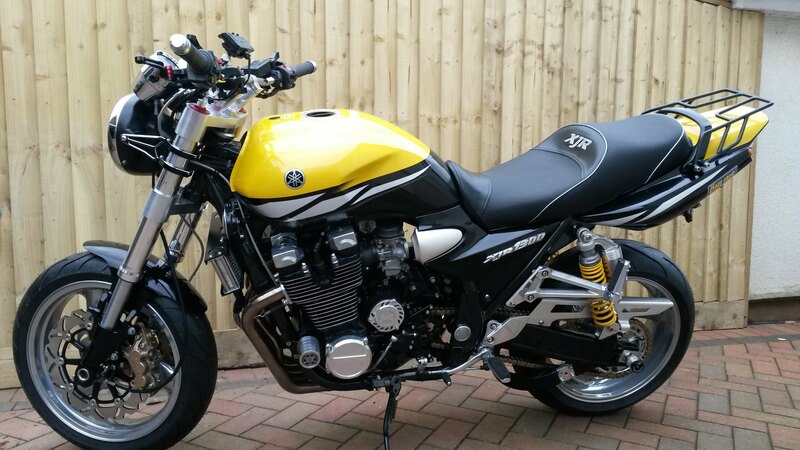 Jooles, many thanks for your in-depth reply - that's a mighty fine XJR you've got there. The USD front end, six-pots and polished wheels look superb!